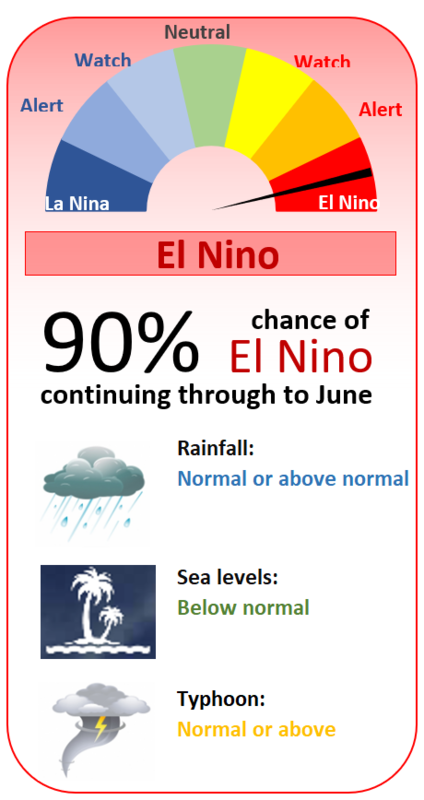 Sea levels in the western Pacific are continuing to fall as El Nino conditions continue to threaten with about a 45% chance of El Nino occurring between March and May increasing to around 60% in June to April. 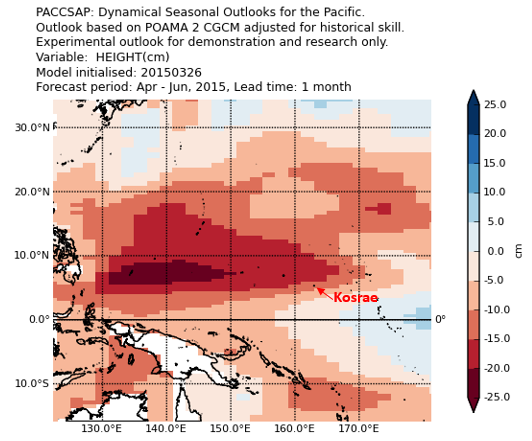 Sea level anomaly forecasts are current mixed with the PEAC forecast for March to May indicating a sea level that is around 2 inches (5 cm) higher than normal (normal being the average sea-level between 1983 -2001) and the Bureau of Meteorology model forecast which is indicating for the Kosrae region a fall in sea level of around 4 inches (10 cm) relative to normal (which is taken as the average sea level between 1981-2010). Irrespective of the different baseline there is still a divergence in the sea-level forecasts reflecting the rapidly changing sea-level anomalies that have been occurring over the last few months. For the April and May tide calendars a value of 2 inches (5 cm) below normal has been assumed. This, along with the lower high tides get at this time of year should reduce the likelihood of coastal flooding occurring due to high tides. However if large waves, swell or strong winds occur at the same time as high tide, flooding of low-lying land and overwashing of exposed sections of the circumferential road will occur.